In this video, you will program three different scrapbook pages, or scenes. The starter project contains four backdrops, a next button sprite, and a title sprite. Click on the next button sprite to see the starter code. You have used these blocks before in other projects. The starter code makes the backdrop switch when you click the next button. It also broadcasts the next message to the title sprite. When the title sprite receives the next message, it changes costumes. Test the code to look at the different scrapbook pages or backdrops. These backdrops will give you ideas for what you can include in your scrapbook. What special memory did you and your friend experience together? This video will guide you through responding to each of these three prompts. First, choose a sprite from the library to be the narrator. The narrator stays on screen as the backdrop changes and tells the user about each scene. Use at least two say blocks to introduce your project. This example says, Welcome to my Google CS First scrapbook. And, click on next to see each page. Check out how some other CS First students introduced their scrapbooks. Next, add a when flagged clicked event. When the flag is clicked, the narrator talks and the user knows to click next. Great, now the narrator needs to explain each scene after the backdrop switches. Go to the events menu, and drag out a when backdrop switches block. Choose the fave project option. Next, add a few lines about your favorite project using say blocks. This example uses two say blocks snapped underneath the when backdrop switches block. But you can use as many say blocks as you want. 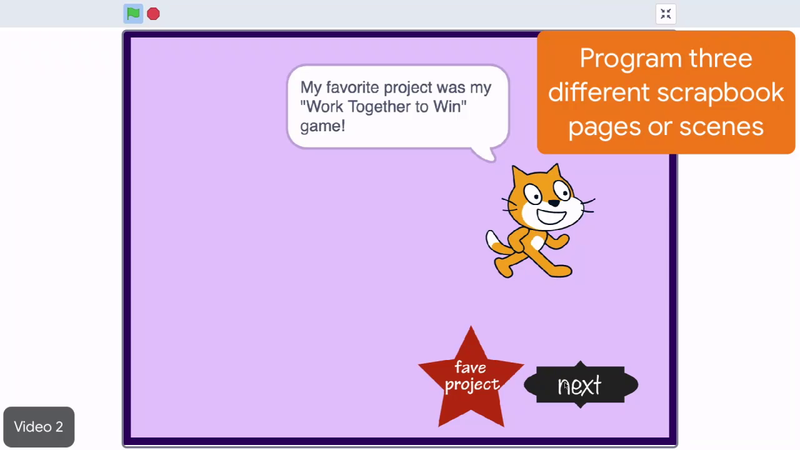 Check out the projects in your CS First passport to recall all that you've created. What will you say about your favorite project? What did your friend think of your final program? Do you have any advice for others who will make this activity in the future? Test your code by clicking the next button until the fave project backdrop appears. The narrator sprite will say the lines you added. After you complete this backdrop, move onto the next. This one is the favorite memory. In the narrator sprite, drag out a when backdrop switches block and select the fave memory option. Add a say block to introduce your favorite memory. Did anything funny happen with your friend during the club? Did you meet a new person? Did you overcome a challenge that was particularly tricky? You can customize the code anyway you like. Finally, make a scene that says thank you to someone. Use another when backdrop switches and more say blocks to narrate the scene. Thank you's can be powerful when they are specific. Did a friend give you a compliment that made you feel good? Did someone at home encourage you to sign up? Click the next button to test your code. Users may click the next button too quickly for the narrator to keep up. To fix this, click on the control menu and add a stop block to the beginning of each code stack, underneath the when backdrop switches event. From the drop down menu, choose other scripts in sprite. This makes it so the narrator says the right thing for the appropriate scene. For example, in this project, when the backdrop switches to the favorite memory, everything else in the sprite will stop. Then the narrator sprite will say its two lines. This ensures that the sprite is running the code that matches the current backdrop. Use the rest of today's club to finish your scrapbook project. What do you want to remember and show to your friends? This is your chance to reflect on what you enjoyed about Google CS First Friends, and to curate those experiences to share with others. Add a narrator sprite to your project. Program the narrator to explain each scene using say and when backdrop switches blocks. Add a stop block to ensure the narrator is only running the code that matches the current backdrop. After you have completed these steps, check out the add-ons on the next page.